Edson with students from Educar es Fiesta. Toady we had the immense pleasure of welcoming this year’s Caritas Speaker: Edson Quezada. 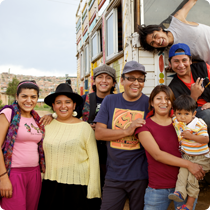 Edson is the founder of Educar es Fiesta (Education is Celebration) in Bolivia. The program aims to help young children in extreme poverty to develop their potential and worth through the Arts. This week’s Project Compassion story is about Raymundo who is a product of this program. Edson took Raymundo from the streets where he had been working from the age of 8, and taught him skills. He now has a degree and works with other young people to give them the same opportunities. Students from Years 8, 9 and 10 were privileged to meet Edson and to hear the story about Raymundo and other children. They learnt about the plight of the children in Bolivia. Our money that we raise will go towards programs such as Educar es Fiesta.